Located near San Diego in La Jolla, CA, National University is geared towards adults with five or more years of work experience, as well as accelerated and part-time learners. National offers programs in the liberal arts, as well as professional and pre-professional programs, and it enrolls nearly 26,400 at its many branch locations and through its online facility.. Describe the type of student who should not attend National University and explain why. Describe the type of student who should attend National University. Why? What is a typical National University student like? Describe the type of person that should attend National University. A typical student at National University is someone who can work in a fast past environment, meet deadlines and dedicate time and effort to succeed. What are the top 3 reasons someone should attend National University? What was a typical National University student like in high school? Describe the type of person that should attend National University. National University private university that holds a lot of online classes. Students that attend the university has to be organized and on top of their schedules. There is less teacher-student interaction meaning more commitment to independent study. National University is the second-largest private, nonprofit institution of higher education in California and the 12th largest in the United States. Founded in 1971, National University consists of four schools and one college, including the Schools of Business and Management; Education; Engineering, Technology and Media; and Health and Human Services; and the College of Letters and Sciences. National University is proud of its commitment to diversity. National University provides more master's degrees in education to minority students than any other college or university in California, as well as more master's degrees in all disciplines combined to the state's Hispanics and African Americans, according to Diverse Issues in Higher Education and the Integrated Postsecondary Education Data System (IPEDS). Annually, National University also ranks in the Top 10 nationally in granting master's degrees to women. In every year over the past decade, National University has prepared more credentialed teachers than any other single institution of higher education in the state, according to the Commission on Teaching Credentialing. National University offers 100 undergraduate and graduate degrees, as well as 30 certificates and 22 credential programs. A leader in online education, National University offers more than 70 graduate and undergraduate degree programs and over 1,200 courses online. National University is committed to accessibility and features locations throughout San Diego County. Regional campuses are also located in Camarillo, Costa Mesa, Sacramento, Redding, San Jose, Stockton, Fresno, Bakersfield, Ontario, San Bernardino, Los Angeles, Sherman Oaks and Twentynine Palms, as well as Henderson, Nevada. National University is the flagship institution of the National University System, which was established in 2001 to meet the emerging demands for education in the 21st century. 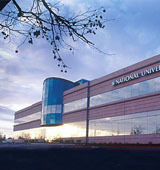 In addition to National University, the affiliates of the National University System are: John F. Kennedy University; National University International; the Division of Pre-College Programs, which includes National University Virtual High School and National University Academy; Spectrum Pacific Learning; and WestMed College. Entities related to the System include the Center for Integrative Health, the National University System Institute for Policy Research, the Center for Performance Psychology, and National University Golf Academy. National University's administrative and academic headquarters are located in La Jolla, California. What are the top 3 things that students do for fun at National University? The top 3 things that students do for fun at National University are go to Starbucks for coffee and study groups, enjoy music festivities and eat out at awesome restaurants. 24% of students received Pell Grants, which are provided by the U.S. government to students from middle and lower income families. It gives you an idea of a school’s socio-economic diversity. A program that prepares individuals to manage casinos and gaming establishments. Includes instruction in casino operations, casino security and surveillance, principles of the gaming industry, ethics, and gaming law. A program that prepares public health specialists to plan and manage health services in local community settings, including the coordination of related support services, government agencies, and private resources. Includes instruction in public health, community health services and delivery, health behavior and cultural factors, local government operations, human services, health communication and promotion, health services administration in local settings, environmental health, preventive and comparative medicine, epidemiology, biostatistics, family and community health, and applicable law and regulations. A program that prepares individuals to provide routine care and assistance to patients under the direct supervision of other health care professionals, and/or to perform routine maintenance and general assistance in health care facilities and laboratories. Protect and police railroad and transit property, employees, or passengers. A program that focuses on the application of descriptive and inferential statistics to biomedical research and clinical, public health, and industrial issues related to human populations. Includes instruction in mathematical statistics, modeling, clinical trials methodology, disease and survival analysis, longitudinal analysis, missing data analysis, spatial analysis, computer tomography, biostatistics consulting, and applications to such topics as genetics, oncology, pharmacokinetics, physiology, neurobiology, and biophysics. The average student pays $21,142 for tuition, fees, and other expenses, after grants and scholarships. Total stated tuition is $12,096, in-state and on-campus, before financial aid. 25% of students receive some form of financial aid. Learn more about financial aid at http://www.nu.edu/admissions/financial-aid-and-scholarships.html. Estimate the net price for you at http://www.nu.edu/admissions/financial-aid-and-scholarships.html. The typical (median) early career salary of National University graduates is $42,500, according to Payscale. Want more info about National University? Get free advice from education experts and Noodle community members. How many degrees does National University offer? Are they all onsite?